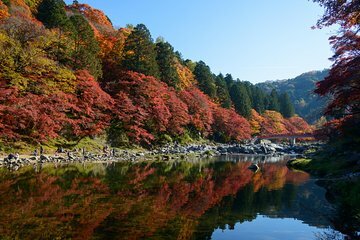 Leave Osaka to admire the fall foliage of Aichi Prefecture, and see Obara and Korankei Gorge transformed into a world of vibrant colors. Known for its fall leaves and shikizakura (winter cherry blossoms), the Obara district of Toyota city is one of the rare places to be in bloom during the autumn and winter months. You’ll discover the best viewing spots with a guide, then head to Korankei Gorge to check out the maple trees that line the Tomoe River. Child (3-5 years old) price includes a bus seat only. Although the scheduled time at Korankei is 2 hours, keeping in mind the journey back to Osaka (especially with the expected traffic), the tour may shorten the sightseeing time.